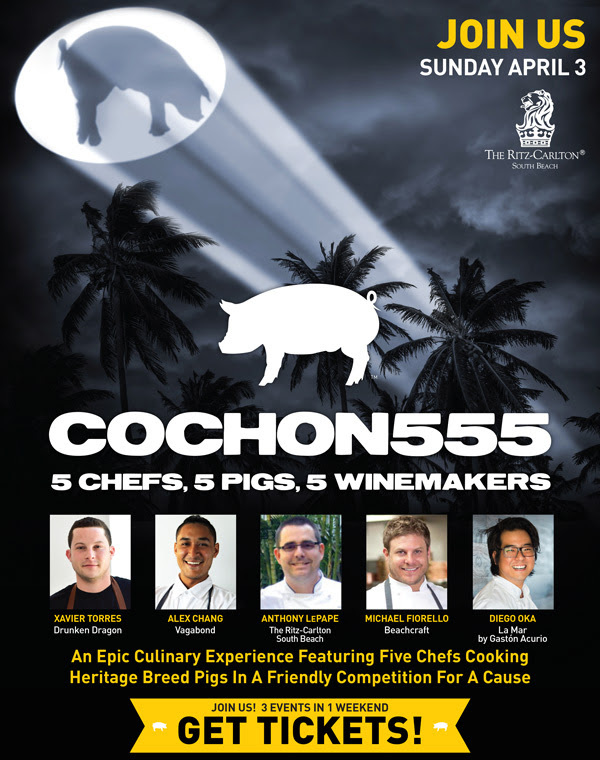 My favorite event of the year Cochon 555 returns to Miami on April 3, 2016. If you are unfamiliar with the event all you need to know is that it features five local chefs cooking five heritage breed pigs in a friendly competition. Tickets are on sale now. You do not want to miss this event. Additionally, the Miami weekend supports a great cause by starting with two unique dinners bringing together five guest chefs, world-renowned winemakers and beverage experts to create a multi-course, interactive dining experience to benefit Piggy Bank. On April 1, the weekend takeover commenceswith a pair of guest chef dinners to benefit Piggy Bank. These unique dinners bring together chefs, world-renowned winemakers and beverage experts to create a multi-course, interactive dining experience where guests have the opportunity to interact with the participating chefs. On Friday, the tour will kick off with the Late Night Asian Speakeasy with Host Chef Cesar Zapata of Phuc Yea and guest chefs Jose Mendin or Pubbelly, Diego Oka of La Mar, Aaron Brooks of Edge Steak and Bar and Timon Balloo of Sugarcane Raw Bar & Grill in an all-inclusive feast paying homage to Chinese, Sichuan, Korean, Thai and Japanese after-hour establishments known to inspire great kitchens across the country. On Saturday, a refined three-hour culinary experience, the Chef’s Course Dinner Series hosted by Michael Fiorello of Beachcraft at 1 Miami Hotel, begins with a reception featuring a selection of passed hors d’oeuvres followed by a seated dinner and premium wine pairings. Both dinners will be limited to 40 seats each night, tickets are available online at $125 per person and 100 percent of the proceeds will benefit Piggy Bank. Piggy Bank was launched in 2015 by Brady Lowe, founder of the Cochon555 US Tour and Taste Network. Piggy Bank’s mission is to create a heritage breed pig sanctuary that provides free genetics and business plans to emerging family farms. The sanctuary will change the future of food by uniting a community working together for safer, responsible farming practices and sharing of genetics, livestock and the sharing of information. Piggy Bank is dedicated to creating the first Open Source agriculture platform through the responsible farming of heritage species. The Piggy Bank farm, located in Missouri, will raise pigs to be gifted only to communities dedicated to elevating the cause and expanding the model of social and agricultural transparency. For more information about Piggy Bank or The Giving Back Fund, please contact Kerith@piggy-bank.org, or watch the video below. Friday kicks off with a Late Night Asian Speakeasy, an all-inclusive guest chef’s dinner party paying homage to Chinese, Sichuan, Korean, Thai and Japanese restaurants. On Saturday, the Chef's Course Dinner Series is multi-course feast featuring notable chefs including five guest chefs cooking courses paired with premium wines and spirits. Tickets to the dinners are available online at $125 per person and 100% of the proceeds will benefit Piggy Bank. Cochon555 is running a 21-day contest, “Can’t We Just Be Friends”, giving away two VIP Tickets worth $400. Friends of the good food movement can sign up for the latest news on the weekend and enter the contest here: http://woobox.com/jnesum.